[AUTO](VC):When placed, COST [Counter Blast (1)], Soul Charge (2), and return up to one grade 2 or less card from your soul to your hand. 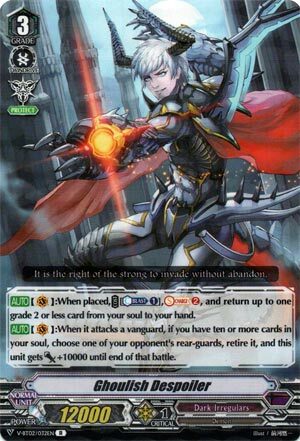 [AUTO](VC):When it attacks a vanguard, if you have ten or more cards in your soul, choose one of your opponent’s rear-guards, retire it, and this unit gets [Power]+10000 until end of that battle. For DI on a budget. Is it worth it though? I mean, the ability to retrieve a soulcharged Perfect Guard is certainly nice, as is the constant retiring once you have it live, but when I relate it to the advantage gained from Demon Eater (we ignore Death Anchor since it’s a given staple and we’re trying to find the best alternative) I sort of prefer Demon Eater, and not just because of the synergy with Death Anchor. As I may have said, hard advantage isn’t my cup of tea, certainly when an undercosted card can easily wipe that advantage out, but to its credit, at least none of Despoiler’s hard advantage is random: you pick the retrieved card, and you pick the retire. If nothing else, I suppose it means you can sit on Despoiler until you reach Death Anchor if you failed to ride that. Actually not terrible, but I think Demon Eater will seal more wins. You could try like a couple of these splashed though, I guess.